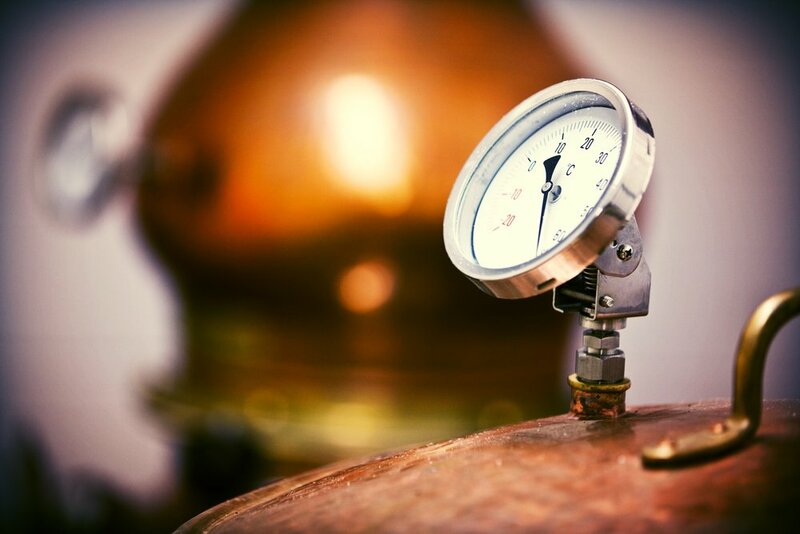 Our gin is complex and unique in both its flavour profile and distillation techniques. We start with a total of 10 botanicals; added at different stages of the process because some flavours profiles are extracted in different ways at changing temperatures. Classic botanicals including Angelica, Orange and Coriander (and obviously Juniper) give the true body to our gin while our more unique botanicals such as Celery Seed and Pink Peppercorn add slightly savoury but warm spicy notes making our gin really stand out from the crowd. 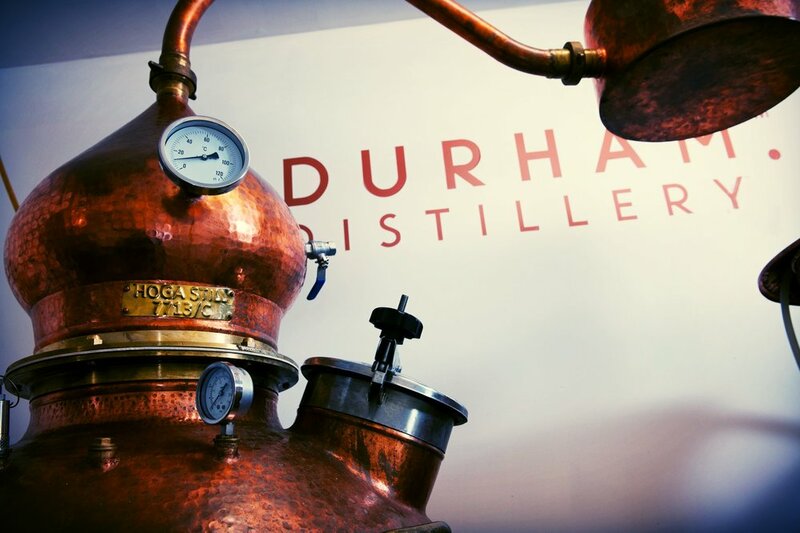 Durham Gin begins it life by hand-crushing Juniper berries, an essential component of any gin. These are added among other robust botanicals, including Angelica and Pink Peppercorn, and placed in a mixture of locally sourced Durham spring water and pure grain spirit. Left to infuse overnight in the still to ‘Lily’ our 400 litre copper pot still; this process is called maceration. The next morning a second batch of botanicals is added and as the still is heated, the vapour rises through a copper tube called a Lyne Arm. Mounted on the Lyne Arm is the Gin Basket which contains the 3rd and final set of lighter, more delicate botanicals, Elderflower, Celery Seed, Cardamom and citrus peels. As still is heated we manipulate the chemical properties of this water/ethanol mixture, the boiling point of alcohol (78.37 degrees C) is lower than that of water (100 degrees C), and such the distilled liquid contains a higher percentage of alcohol. As evaporation begins and the top of the still is cooler than the bottom a temperature gradient is established. The vapour condenses when it reaches the top of still and falls back down, this process of evaporation and condensation is called Reflux and helps to produce a smooth spirit. Eventually the vapour rises through into a copper tube, the Lyne Arm, where more flavour extraction occurs, this is through vapour infusion of light botanicals stored in a Gin Basket located halfway along the Lyne Arm. All the possible flavour has been extracted when the vapour reaches the worm tub – a traditional spiralled cooling system. It contains a copper coil which is a good conductor of heat and increases the surface area for heat transfer, immersed in cold water Lily utilises this old fashioned ‘worm tub’ to condense the hot gin vapour down to a cool gin liquid, this is collected at 80% abv. Finally the liquid gin cascades off the Parrot Spout, a specially shaped spout for collection. Not all of the liquid is ‘good enough’ i.e. has the correct flavour profile for our gin and such ‘cuts’ are taken throughout the run known as the ‘heads’, ‘hearts’ and ‘tails’. The first of liquid the ‘heads’ (a secret number of litres) doesn’t have the correct flavour profile and such doesn’t make it into Durham Gin. The second section, the ‘hearts’ contains the precious gin and the third section, the ‘tails’ is kept aside as again the flavours aren’t quite right for Durham Gin. These later get recycled into our Vodka, nothing goes to waste. As Durham Gin is a London Dry Gin, only water is added at this stage to take it from 80% abv down to the more palatable bottling strength 40% abv.